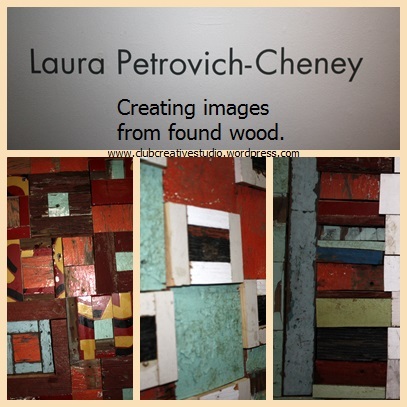 Club Creative Studio loves to share creative low-cost ideas on Two-Cent Tuesday. Today, the blog has a focus on an inexpensive project that will improve or change your world with the use of spray paint. 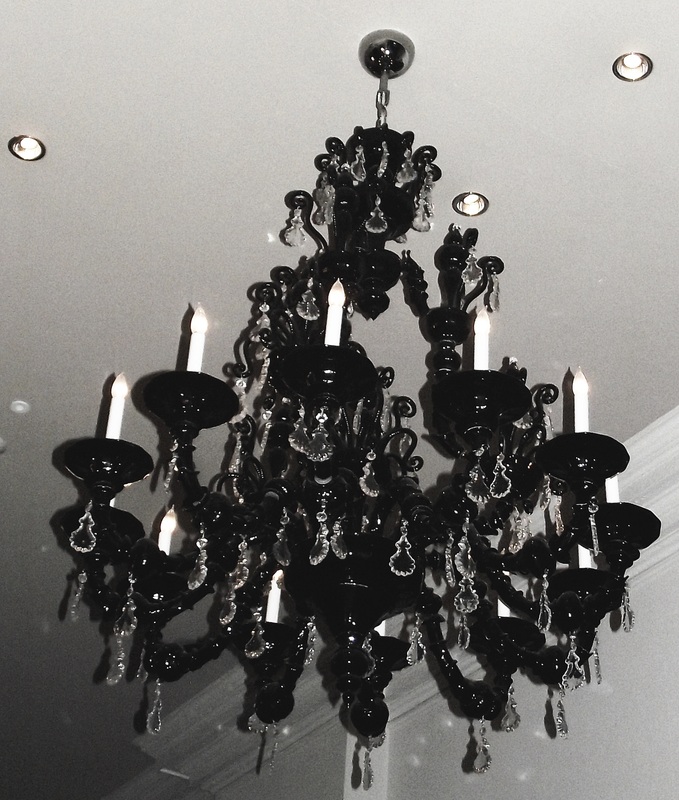 If you want a dramatic look in lighting, consider spray-painting your fixture black. I recently took this photo of a beautiful crystal chandelier at The Union League in Philadelphia. I thought while admiring it that this look could be replicated easily and cheaply with black spray paint. If however, you have a metal light fixture or anything made from galvanized steel, there are considerations for paints. Galvanized steel is a metal for example that is difficult to paint. So, knowing the material you are working with first and foremost is important so that you are not wasting your time or money in your creative process. Check the can labels to recognize the best spray can type for your projects. Getting back to Galvanized steel for example, that material cannot be painted with normal alkyd-based paints, which almost all spray paints are based. It is suggested that if there is any “alkyd…” don’t even think about using it on your steel project. Looking on the aisle shelf, the brand “Rust-o-leum” does put on the back of their spray paint cans a warning not to use their spray paint on galvanized steel. However, beware that most spray paint companies do not include this warning. So what makes that metal so difficult? It is steel that has a zinc coating to increase the steels corrosion (rust) resistance. It’s “hot-dip galvanization” is a process that makes it similar to steel with large visible grains. Using spray paint to other materials is not as difficult to choose. Need ideas on what to spray in your home for a new creative twist? How about these suggestions: cabinet knobs and other fixture handles, frames for photos or mirrors, light switch plates, file cabinets or storage furniture, light fixtures, lamps, chandeliers, candle holders, appliances, radiators, steam risers, and even plastic, wood, wicker, and metal furniture. A pro of using spray paint over brush application paints is that spray paint creates a smooth surface as opposed to brushing on paint. Faux textures like stone and granite as well as unique finishes like a clear coating and metallic are available for your experimentation. Suggested tips for great results are on all can labels. You may need to gain extra supplies and endure additional steps besides a quick spray. Primer, sanding, or wire-brushing may be needed, depending on the object and the paint. So while this process can be low-cost, it does have a small percentage of cost associated with it depending on the size of your project and the type of spray paint you require. No matter if you are making a cosmetic change or improving a home item like a flaking barbecue grill, spray paint is a great option to a quick change or improvement. Using spray paint for an improvement is a low-cost idea that can help in a creative improvement solution. Let us know if you have used spray paint in a recent project. Taking a before and after photograph can be helpful to appreciate how far a project has come. Club Creative Studio has been a busy place. I have had a great time working with my mixed metal recently. Discovering how and what I want to create by meshing layered metals in a cold connection (rivet technique) is a fun challenge. Of course, I wish to also incorporate my hand-made beads as well. I have been working with 24-guage sheet metals. I have found that to be the most beloved thickness to design and make my jewelry with. My studio is quite noisy when I decide to texture my metal pieces because I am hammering and pounding. I have a new textured hammer that is double-sided and has interchangeable ends for making interesting designs. And I also use my chasing hammer as a multi-purpose hammer for smoothing and doming, shaping and riveting. The ball-peen hammer is my main punching tool and I love the surface texture I can pound using this type hammer. 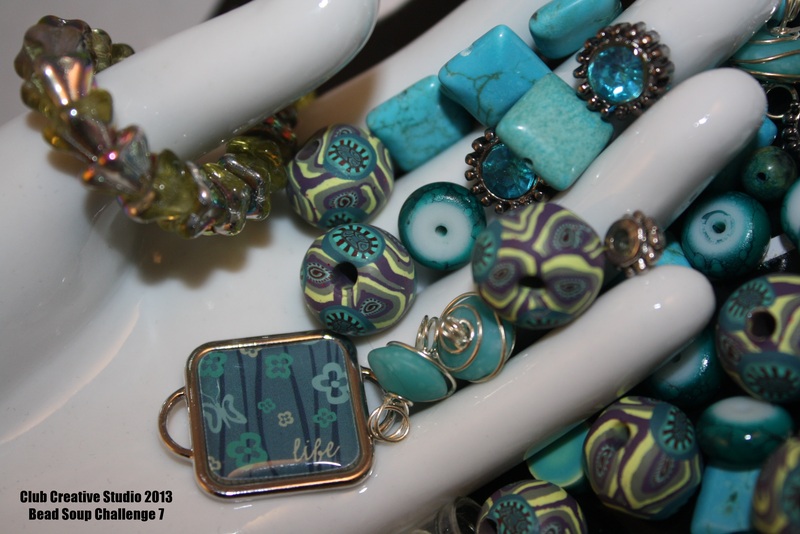 Recently to incorporate my hand-rolled clay beads, I create a pendant using mixed metals and a cold connection, then add Club Creative Studio one-of-a-kind beads to the art. What a great combination. To see more, be sure to check on the Facebook page and online. I will be adding sneak peek photographs and items available for in those particular venues. I will be taking photos of my metal working tools at some point and use them as a blog topic. Would that be of interest to you? Let me know what other tools of my trade you would like to learn more about. Be creative every day! standard storage box for jewelry. Do you have something like this? 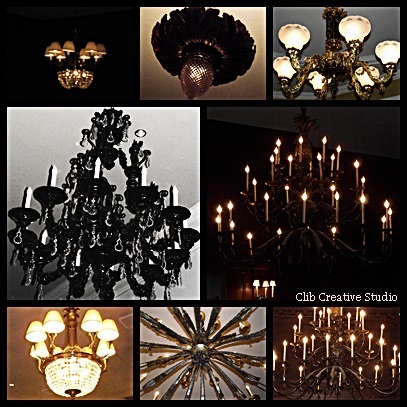 Club Creative Studio enjoys sharing creative knowledge that you can use or pass along. In today’s TNT (This-N-That) blog post, you can look no further than the jewelry box on your dresser for the answer to a better life. Well…sort of. Here is a question: How can your jewelry make your life better? 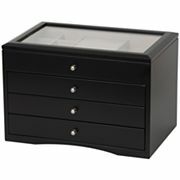 At first glance of our jewelry hidden within the standard storage box designated the “jewelry box”, you may seem frustrated at disorganization. Maybe your container is too small for your collection, maybe the dividing spaces are not adequate to separate or display the jewelry you own. Another problem with your storage may be your actual items you are holding on to. 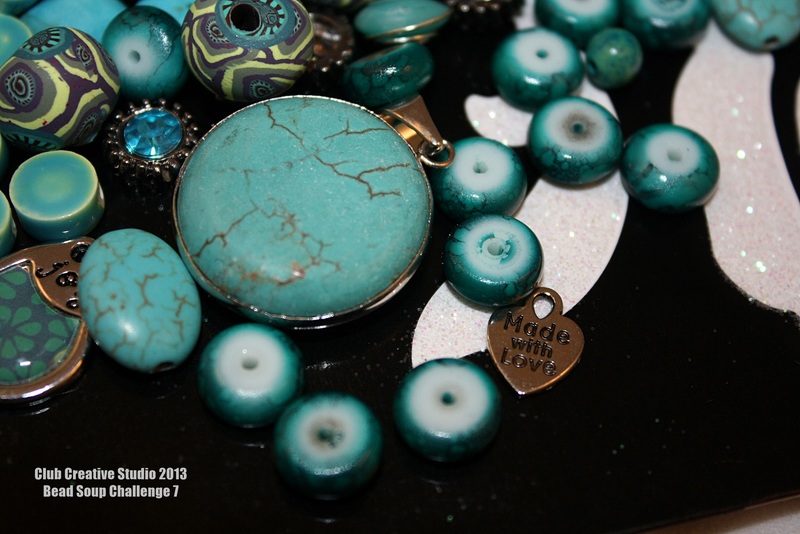 Do you have lost or broken jewelry sections, tangled chains, or out of fashion creations? It may seem difficult to appreciate knowing that life can be made better by simply displaying your jewelry in healthier ways. You can be quite innovative in how you do this. In this respect, your jewelry has a link to making your life better. Your life can be more orderly and your possessions more valued if you have a means to care for the jewelry you own using proper storage. After all, was not this the thinking methodology of “Santa” who gifted you the pink ballerina musical box for your plastic necklace? Did you own a wind up musical ballerina jewelry box? I really should practice what I am preaching here. I personally have a mixture of ways that I refer to as my “jewelry organization”. Some of my fine gems are stored in their original boxes and placed in a safe. Other jewelry items that I own are displayed on hooks, smaller elements are placed in a traditional jewelry box and yet other creations are organized in small, clear, stackable bins with handles that are easily ready to view when I have to travel, or relocate. No matter if you store in a standard table top box, in free-standing legged armoires, in a closet organizer pouch, or on some type of rack, caring for your jewelry and having access to it easily is the key to experiencing storage happiness with your jewelry. To properly store for in-home, short-term, I suggest using a hooked display rack, ladder-type or screen-hole system with holes for earrings, box or plate that is placed in a room where you have an adequate landing spot to return to again and again. Being able to quickly see and review your jewelry choices is important for the items that you wear most often. If you make a habit of returning and neatly replacing jewelry in the same spot your life will be better as you will not waste time finding what you need. Your treasures will not be lost and they will last longer from the tender loving care and respect. A great “go-to” spot will serve you well in jewelry organization. Found at: overstock.com for something like $130. 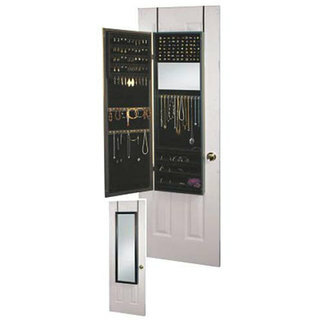 There is a wonderful product I learned about from a home shopping show that seems to be every girl’s dream jewelry case. It was a rectangular box that opened up on one hinged side and attached to the back of any door. It was framed out and had a mirror on the front. How wonderful is that? Fun and function…I LOVE IT! This type of jewelry storage unit could be considered both temporary and permanent because of its size and depending on the location you place it. It was designed with many specific compartments. The areas had distinct places for bracelets, rings, necklaces, earrings, even scarves and belts. It had a secure hanging device that was over-the-door, so no nails were required for its installation. So, with these few helpful tips in mind, maybe you can make your life better by making a special place for your jewelry. Happy shopping and organizing. Be sure to stop by the blog again for creative information you can learn and share. We’d love to hear your conventional and non-traditional methods for storing your jewelry because you never know who may need the suggestions and help. Thank you. Learning is continual and constant and creative learning is an individual journey. What can we learn from the above quote from the great Michelangelo? Whether you are an emerging leader or artist. If you are a seasoned veteran at your craft, there’s always more to learn and new ways to grow within that field . At 87 years old, Michelangelo said it well: Ancora imparo (“I’m still learning). Club Creative Studio appreciates the learning curve and supports curious minds in pursuit of creative knowledge. Like Michelangelo, the continual association with learning can be a passion and a reality to get the know=how to become better at something. Learning opens doors to growth and opportunity. What do you think that Michelangelo at age 87 meant when he said “I am still learning.” Do you think that he meant to express that he did not know it all? Did he perhaps imply that there is so much to learn about so many topics in the span of a lifetime? Thinking about this quote today, what do you think this quote would mean to you if you were near the age of 87 versus now at the age you are now? This quote is great for many reasons if you ask me. It gives me a sense of wonder that the love of learning is a gift at any age, as well as a part of our life at any stage. We simply can’t know or experience everything in our life-time. We are in a constant revolution of thoughts and learning episodes. We learn from our own life and from each other’s journey. We face trial and error daily and we are on a vicious cycle to catch up with the new as we hold onto and learn from the past. 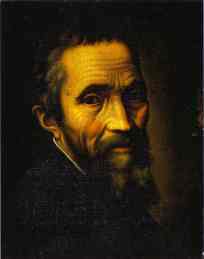 Michelangelo di Lodovico Buonarroti Simoni, known commonly as Michelangelo, was an Italian Renaissance Artist: sculptor, painter, architect, poet, and engineer who exerted unparalleled influences on the development of Western art. This quote comes to mind for me whenever I attempt a new skill and I have much to learn. Although we look at the list of talents Michelangelo shared with us, he had to have known that with each of his creative jumps, came a humbling thought that it was all a learning process. My life and creative offerings take on a personal spin from what others have done on as well. Each creative process brings me to the realization that I can be comfortable with my level of expertise but, I can also take notice that with each topic at hand, I have opportunities to learn even more. Taking time as an example, to attend more art classes, workshops, seminars, teleseminars and hands-on lessons, I have gained a newfound love for learning once again. I can take time to slow down for instruction from others. I don’t have to learn it all by myself. In this same light as Michelangelo, I can say today that I too am still learning. Still learning new techniques, skills, people, traits, still learning about history, present day events, creative expressions, and still learning the best way to learn. As your learning adventure marches on, what can you share about the level of excitement of continual learning? Share your comments below, we’d love to hear about your challenges, and success stories about learning something new that helped you grow creatively. Let there be light…and light fixtures. Club Creative Studio dedicated a few more intense glances towards beautiful light fixtures recently at The Union League in Philadelphia, Pennsylvania. Glowing and glamorous, these fixtures showed traces of their utter radiance and historical pasts. They are displayed with care with historical reference fitting the building’s era. Is there a wonder why I find these to be so interesting? No matter if it was a glowing glass globe, a candle stick style or a massive crystal chandelier, all are beautiful while they are lit as well as unlit. I see more than a glow when I look upward to the ceilings, I notice form, shape and texture. 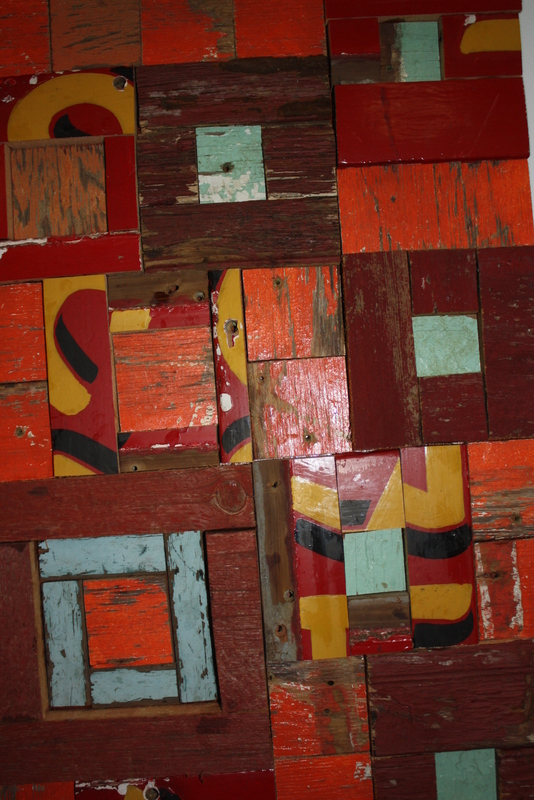 The workmanship, and design elements make these creations hanging works of art. And when I stand directly under a light fixture, well the perspective is breathtaking as well. The next time you flip a switch at home or in a more public place. Take time to look up. What do you see? Let there be light, a light fixture that you can appreciate for its aesthetic or historical value. Let there be a light for you to appreciate and admire. 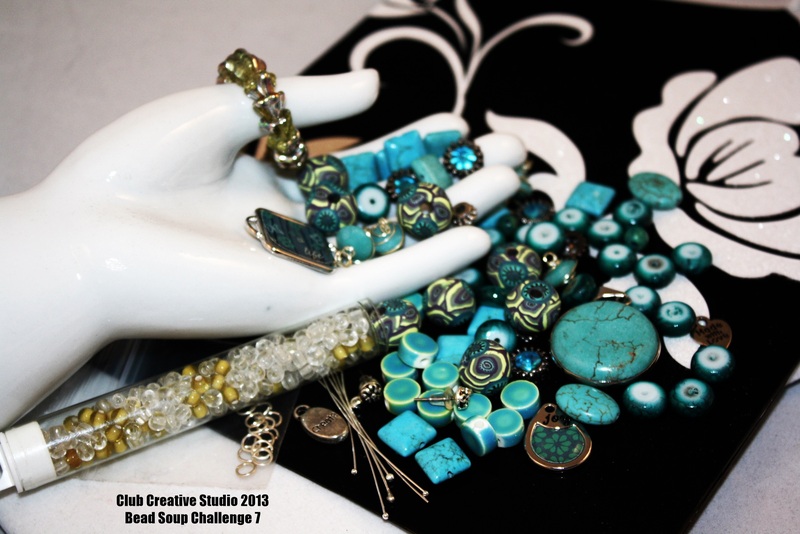 Club Creative Studio is taking part in the Bead Soup Challenge #7. It will be fun sharing Bead Soup. Please review past posts regarding the details of this wonderful sharing and creating challenge for those making hand-made beads and jewelry from them. Since the arrival of my beads from my bead exchange partner, Susan I have had time to simmer the ideas I have and will soon begin my creative thought process and my design using the beads she sent me last week. I am looking forward to the creative growth. I have not gotten official word that my box has indeed arrived to New Hampshire however, it has had adequate time. With that in mind, I would like to go ahead and share what I included in my package of fun. The idea of sharing is to highlight some of your own hand-made beads and pair them with interesting items that can be utilized in a creative challenge for the artist on the receiving end to express in their own style. Lori Anderson is the host and brain-child behind the organization of this particular bead challenge. It is perfect “soup” , warming my soul on a cold winter day for me living in Philadelphia. I welcome the challenge. I included a variety of supplies and I hope she is inspired to do something fun and add her own components if she desires as well. I included items of stone, Czech glass, hand-rolled clay beads, hand-twisted wire worked beads, seed beads, ceramic, rhinestone and metal charm elements just to name a few. Perhaps she will blog about her experience. I plan to document my creative journey on the Club Creative Studio Facebook page with photos and within this blogging platform. I am happy to share the experience of the creative thought process and creative expression of this beading challenge by sharing my Bead Soup Challenges. 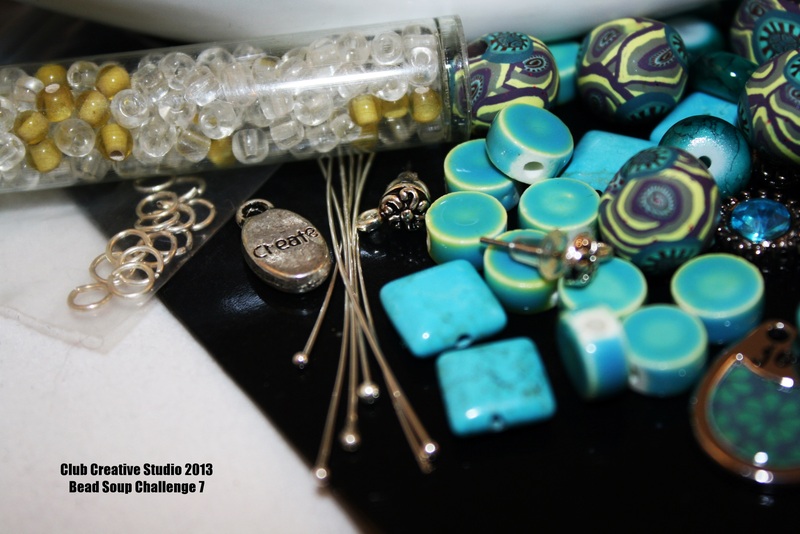 Club Creative Studio is one of over 500 participants in the 7th Bead Challenge and Blog Party. Wonderful artists, wonderful talents, wonderful art, wonderful blogs and wonderful opportunity to learn about beads and beading. Good Luck to all who are creating with beads for the love of art. What would be reasons why someone would desire to participate in a bead challenge? 1. Taking part in a bead challenge is a creative growth step. Anyone who takes part in a bead challenge has a will to grow creatively. 2. Taking part in a bead challenge allows you to discover the power you have within to create with unknown factors and become successful from that. 3. A beading challenge brings together like-minded persons who create and design items using beads. They also bring together friendships with common grounds. 4. Taking part in a bead challenge is a welcome challenge for many to become aware of talents of others who are creating hand-made beads and items from them. Club Creative Studio’s post today highlights the special delivery from the mail this afternoon. My special arrival came today, it was a box of beautiful beads. The beads in my photograph were sent to me specifically for the Bead Challenge called: Bead Soup Challenge & Blog Party, #7. Susan Sheehan is my Bead Soup Bead Challenge Buddy. 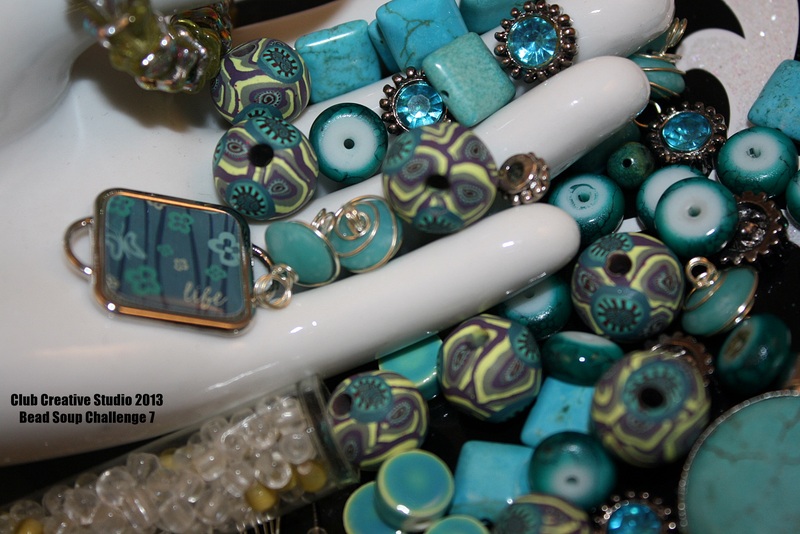 We were paired from over 500 participants in Lori Anderson’s Bead Soup and Blog Party Challenge. 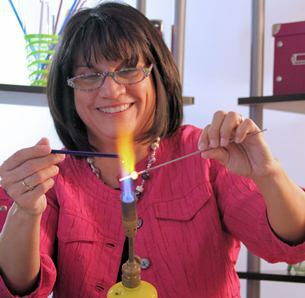 She is from New Hampshire and works primarily in glass, creating wonderful beads, many with the floral motif theme (which is right up my alley). We exchanged boxes and I received mine today! She should get the box that I sent her by Monday. The excitement starts to build the minute you are assigned your bead partner’s name and location. I had a chance to look on Susan’s website and read a few blogs once I knew she was assigned to me. With exchanged contact information we are able to keep track and communicate along our creative journey. It is wonderful that we have put together totally different packages to inspire each other. She creates in her studio and can be found selling her art at: http://www.susansheehan.etsy.com The challenge aspect comes next as we sit in front of the bead stash wondering what to create and how to use the elements in front of us. I anticipate using a few of my own items as well, but, the majority of the supplies will come from the pile she has gifted me. What’s in her shared treasure box? Admiring this selection, the first impression that I had was she has a great sense of color. The combinations are wonderful and I am inspired to create starting with a good color palate in front of me from the get-go. She included an array in styles of beads which will certainly make for an eclectic feel of whatever I end up creating from this collection of bead types. I am faced with working with a variety of shapes, sizes and weights of beads and that is a challenge unto itself. I am not afraid of mixing metals so the copper-colored chain and the silver clasp and bead caps don’t frighten me. Susan has challenged me to basically create using pink, turquoise, and brown. There are many larger beads all of which can combine to become focal beads or serve as a focal bead all alone. The obvious choice is using the large amber-colored glass round as the main focal bead. It made me think immediately of using it as part of a center tassel, at first glance so I will see if that changes when I hit the design table or not. The tube beads dotted with mini-seed beads and floral theme motif are about one inch long, there are four of those. Two brown rounds are not identical but have been made with the same feel. 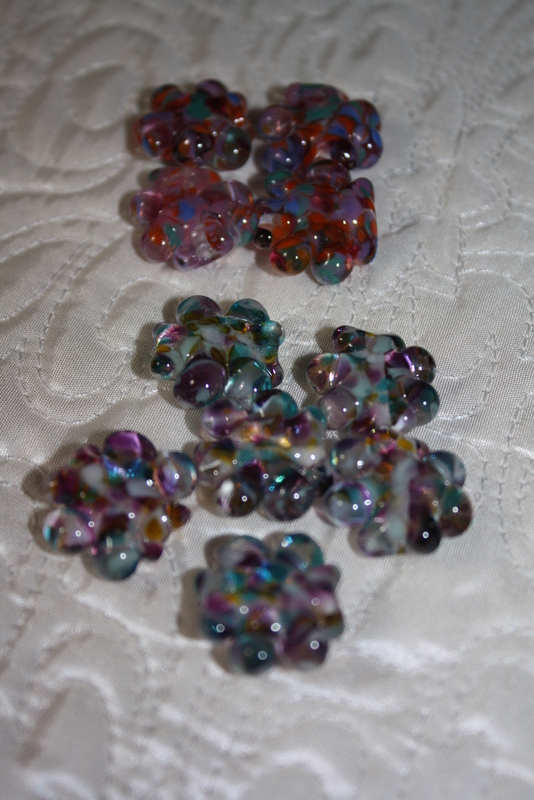 She included six interesting pink glass mosaic feel beads that shimmer in the light, those are cool as well. With an interesting mixture of tiny crystals and Lucite, I can imagine using them as little accents of color and dangle beads right now at first glance. The highlight of her box are of course her hand-made glass floral beads. She has included ten for me to use in my creation. They are dotted with spots of turquoise, pink, brown, orange and a little bit of purple. Wonderful! After I let my “soup” simmer overnight, I will think about what I want to create and then sit down and design, arrange and question. I plan to document my creative thought process and share the development of my special arrival…my box of beautiful beads. Be sure to visit this blog again as well as the Club Creative Studio Facebook page at http://www.facebook.com/clubcreativestudio for updates on my beading challenge process.